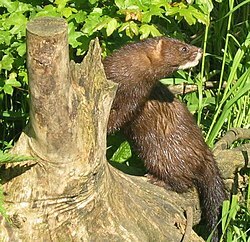 Minks are small, short-legged members of the Mustelid family. The mink is an aggressive mammal that is adapted to a semi-aquatic life. Mink live in swamps, rivers, marshes, lakes and streams in North America, Europe, and the far west of Asia. Mink have a life span of about 8 to 10 years. 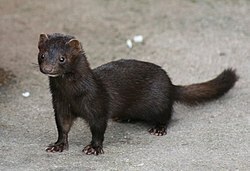 Minks are carnivores (meat-eaters). They eat small mammals (like mice, rats and muskrats), frogs, crayfish, fish, insects, eggs, and ducks. Owls, wolves, coyotes, and bobcats prey on the mink. The breeding season is April to May. It takes 45 to 52 days after mating for birth to take place. A mink litter normally has 6 to 10 cubs (kittens). This page was last changed on 16 March 2018, at 12:20.